Synopsis: When two adventurous cousins accidentally extend the last day of summer by freezing time, they find the secrets hidden between the unmoving seconds, minutes, and hours are not the endless fun they expected. Cousins Otto and Sheed are lamenting the impending start of school and trying to decide what to do with their last free day when an adventure drops right into their laps. A man calling himself Mr. Flux offers to take a photo of the two, but before he can snap the pic, the sky opens up and another man appears warning them to take the camera and run, and NOT TO TAKE ANY MORE PICTURES. They soon figure out that the camera is actually capable of stopping time, and the adventure that ensues is a wild one! There are more fantastic creatures, people, and events than I could name if I wanted to. The story is not just a sci/fi, fantasy, mystery adventure story though. It is also a tale about friendship and respect for other people, but those themes are so well woven into the story that a young reader will never feel they are being lectured or taught something along the way. 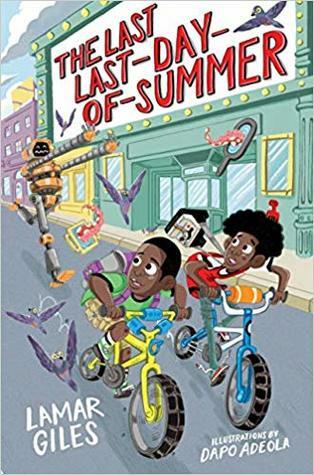 The Last Last-Day-of-Summer would make a great read this summer when the kids are out of school. Thank you so much to the author and publicist for sending me a copy of the book to review. Putting more books featuring diverse characters into the hands of all children. A world in which all children can see themselves in the pages of a book. A good mid-school book should set examples as well as keep a young readers interest. Sounds like this one makes the grade. Thanks for the review.